#Peterhof. #Petrodvorets. #SaintPetersburg. #StPetersburg. #BestOfStPetersburg. #SaintPetersburgPrivateTour. #PeterhofFountains. #GrandCascade. #PeterhofPalace. #RussianPalace. #RussianEmperors. #RussianTsars. #StPetersburgArchitecture. Tour Peterhof. Peterhof tours. Peterhof excursions. Trip to Peterhof from St Petersburg. Peterhof Palace tour. Peterhof Saint Petersburg. Visit Peterhof. What to see in St Petersburg Russia. Things to see in St Petersburg Russia. St Petersburg tourist attractions. 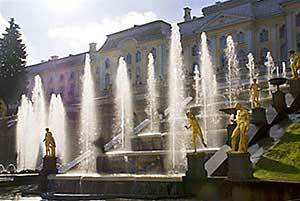 Fountains of Grand cascade of Peterhof. See also private tours to Pavlovsk. Peterhof or Petrodvorets is situated on the bank of the Gulf of Finland and is a world famous Park and Palace ensemble, well known for its unique fountain system. The best time to take a tour to Peterhof is summer, when you can enjoy a most pleasant walk around the grounds and see the huge cascade systems with the highest water spray rising up to 23 meters, single fountains decorated with magnificent marble and gilded statues, jester fountains with children having fun running through the pouring water. And if you are especially lucky you will manage to see a rainbow in some of the fountains. A usual route of the tour includes the visit to the Grand Palace of Peterhof. And though it is one of the richest and most interesting summer palaces in Russia, which is no doubt worth seeing, we still recommend an alternative option. Directly on the bank of the Gulf of Finland you can find a small but unique palace called Monplaisir*. 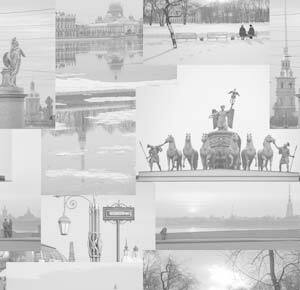 It was a favorite place of Peter the Great and it still bares the trace of personality of its first owner. Also it is an extremely rare example of architecture of Peter's times. If you choose to visit this place it saves you a lot of time for the Park and makes your tour much more relaxing and not less interesting. You can find more information about Peterhof here. The Catherine's Block - a small but exquisite palace constructed for Empress Elisabeth I and redesigned for Alexander I in empire style. The Barth House - a little pavilion near Monplaisir palace where a Russian bath and a dining hall was designed for the Russian Tsars. The Hermitage - a little entertaining pavilion designed for the guests of the Royal family to have fun. The Marly palace - one more little private palace that dates back to the time of Peter the Great. The Cottage*** - a private Palace of Tsar Nicholas I and his family which is situated in Alexandria park. A quiet and charming place which is of the main tour route and it is just 5 minutes drive from the Park of Peterhof. NB! The entrance to the Park is no problem, but if you intend to visit the Palaces in high season it is essential to have a guided tour booked in advance. * In rainy weather the Monplaisir is closed, but in this case we can replace it with a visit to Catherine's Block or The Barth House, which are also very interesting. ** It is a very good way to go by hydrofoil. It takes you directly to the Park and reaches it in 30 minutes. Notice that hydrofoil does not go in case of high wind or mist. *** We strongly recommend this option. Despite it is not as famous as Peterhof itself it may turn out to be the best experience of the tour.